When European wine and brandy production was ravaged by a plague of insects in the late 19th century, Scotch whisky was drafted as a substitute for cognac. The whisky industry exploded into life, turning it into the premium alcoholic beverage in Europe. 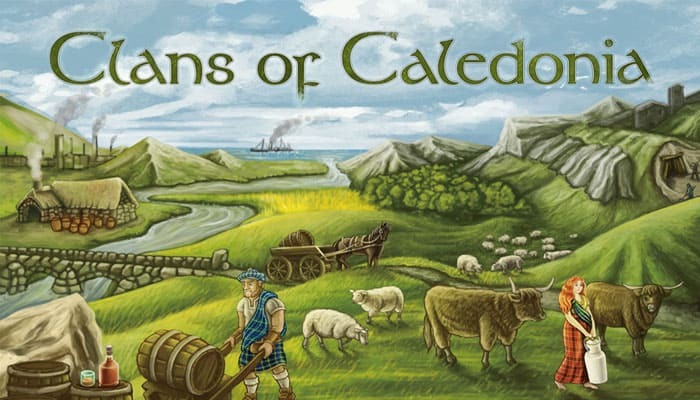 In Clans of Caledonia, players represent unique historical clans competing to produce, trade, and export agricultural goods, as well as their famous whisky! 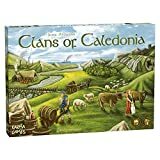 When you play Clans of Caledonia for the first time, please consider playing with a simplified ruleset. See appendix on page 9 for simplification variants. The game map consists of four double-sided Map modules which are labelled both by module (A-D) and by side (1-2), offering 16 different map configurations. Randomly choose a side for each Map module and construct the game map by making sure the rocks showing the module letter are in alphabetical order in a clockwise direction and are adjacent in the middle of the map. Shuffle all the Port bonus tiles and randomly choose four. Place one tile adjacent to a factory at each corner of the map, with its exact location depending on the player number. The 1-2 player icon indicates the space to put the Port bonus tiles in a 1 or 2 player game. The other arrow icon indicates the space for a 3 or 4 player game. Return all unused Port bonus tiles back to the game box. Flip the Market board to the appropriate side for the number of players and place the transparent Price markers on the encircled starting prices. Place the six types of Goods tokens (Wool, Milk, Grain, Bread, Cheese and Whisky) and their tiles below the Market in separate piles. Place the Export board beside the map, with the side face-up showing the icon matching the number of players. Then, shuffle the Scoring tiles and choose five randomly. Place these face-up in a random order in the five slots on the edge of the Export board. Shuffle the Export contracts and create a facedown draw pile. Put one Export contract from the draw pile face-up on each box on the Export board (in a solo and 3 player game, one box remains empty). Place the players' Glory tokens and the Import tokens (Cotton, Tobacco and Sugar cane) off the board. On the 1-2 player side, the dice icons are only relevant for the solo game. Place all of your tokens on the corresponding locations on your Player board, four of each of the following: Sheep, Cows, Cheese Dairies, Bakeries, Fields and Distilleries. Place the eight Workers on the four forest locations (representing Woodcutters) and on the four mountain locations (representing Miners). Take four Port markers in your colour. Fill the Merchant track with five cubes, representing Merchants. The remaining two cubes go below your Player board as starting stock. Place the Shipping token on the first location on the left of the Shipping track. Place the two Technology tiles flipped to the side with the arrow on the upper left-hand side on the respective locations below the Workers. Take one Export box tile and place it next to your Player board with the side face-up showing the icon matching the number of players. Determine a starting player randomly. The turn order in the first round is clockwise. Put all players' Turn order tokens accordingly on the Turn order track on the Export board. In subsequent rounds the turn order is determined by the order in which players pass. Randomly draw one more Clan tile than the number of players (e.g. four Clan tiles in a 3 player game). Then, randomly draw as many Starting tiles as Clan tiles and randomly allocate one next to each Clan tile. 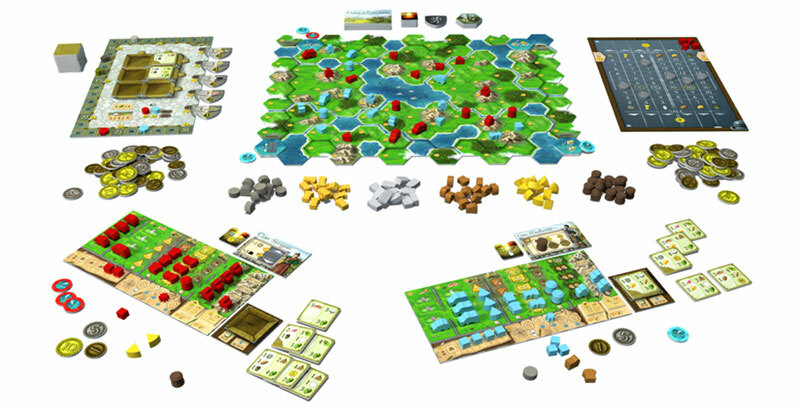 Starting with the last player and going in reverse turn order (counter-clockwise), each player chooses a Clan tile and its corresponding Starting tile and places both in front of themselves. The starting player will thus choose last and will choose between the remaining two clans. The clans are explained in detail in the appendix. 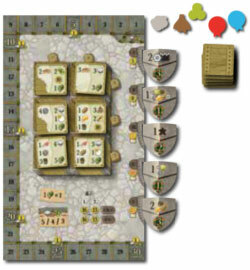 Players receive both the Goods and the money shown on their Starting tiles. 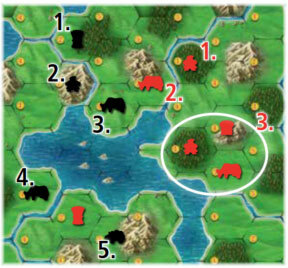 Beginning with the starting player and continuing in a clockwise order, each player places one Worker (Woodcutter or Miner) from the top of their Player board onto an empty hexagonal space on the game map. Woodcutters must be placed on an empty space with a forest and Miners must be placed on any empty space with a mountain. Then in reverse turn order (starting with the player who placed last and continuing in counter-clockwise order), each player places a second Worker. The second Worker does not need to be adjacent to the first placed Worker. Each space can only ever have one unit (Worker, Sheep, Cow, Cheese dairy, Bakery, Field or Distillery) on it at any time. Each time a Worker is placed (including during the initial setup) players must pay both for the land where they place their Worker and for the Worker itself. The cost of land is indicated by numbers on each space on the map, ranging from £1 to £6. The cost of a Worker is £6 for a Woodcutter and £10 for a Miner (as indicated above the Workers at the top of the Player boards). Phase 1: Preparation Phase - Flip the Scoring tile of the previous round, refill any empty boxes on the Export board and retrieve your Merchants (skip this phase in the first round). Phase 2: Action Phase - Players take Actions until all players have passed. Phase 3: Production Phase - Units on the game board produce Goods and Income. Phase 4: Scoring Phase - Players receive Glory according to the current round's Scoring tile. At the end of the fifth round, final scores are calculated and the player with the most Victory Points (VP) is the winner. Flip the previous round's Scoring tile face-down. If needed, refill any empty boxes on the Export board with Export contracts (according to player count). Players retrieve their own Merchants from the Market and place them next to their Player boards. The Merchants that are in your stock, not on your Player board, are ready to be used in a Trade action. You can send these Merchants to the Market to buy or sell Goods. Place as many Merchants on the buy or sell area of a single Good (designated by the up and down arrows respectively) as the quantity of Goods you wish to buy or sell. These Merchants remain on the Market board until retrieved in the subsequent Preparation phase. You then pay/receive the Good's current price multiplied by the number of Goods bought or sold. All trades are made with the common Goods pools. Afterwards, the traded Good's price is adjusted by moving the Price marker according to the arrow of the area (up when buying or down when selling) by as many steps as the number of Goods traded. Players may only buy or sell one type of Good during a Trade action. In order to trade different types of Goods they must take the Trade action multiple times. It is prohibited to have Merchants from the same player on both the buy and sell area of the same Good. High-speed trading was not common in 19th-century Scotland! Pay the current round cost to take any Export contract from the Export board and place it on your empty Export box. The cost is determined by the game round and is indicated next to the Scoring tiles on the Export board. Note that in the first round, players receive £5 when obtaining an Export contract rather than paying a cost. You can have only one unfulfilled Export contract on your Export box (exception: Clan Buchanan). You must fulfil your Export contract before obtaining a new one. It is not possible to get rid of unfulfilled Export contracts. 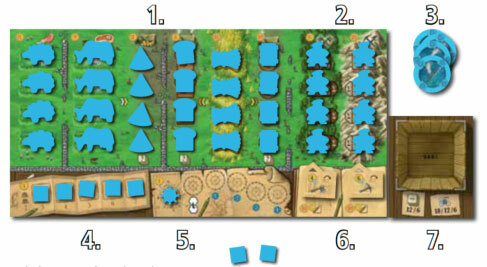 Place one unit (Sheep, Cow, Cheese dairy, Bakery, Field, Distillery, Woodcutter or Miner) from the top of the respective column of your Player board onto any empty space of the map that is neighbouring or within Shipping reach of any of your units. Pay for the costs of the unit (coin with red number above the respective unit) and for the space (coin with red number between £1 and £6). Neighbouring: adjacent space with no river in between. Within Shipping reach: a space that you can reach with your current Shipping level. If a space contains more than one of these land types, you can place any corresponding unit on it. In the image shown, a player could deploy any unit on this space because it contains all three land types. Consequently, if you have deployed all your Woodcutters you cannot expand to a space that contains only forest. Likewise, if you have deployed all your Miners you cannot expand to a space that contains only mountain. If you expand into a space neighbouring another player's unit (adjacent and no river in between), you may immediately perform an additional Trade action and buy the type of Good produced by the neighbouring unit from the common stock. You cannot buy more than three pieces of the same type of Good per turn (four pieces in a 2 player game). The price of Basic goods (Wool, Grain, Milk) is reduced by £2. The price of Processed goods (Bread, Cheese, Whisky) is reduced by £3. Proceed with the purchase as explained under the Trade action. You need to have the appropriate number of Merchants available to use this bonus. Prices are adjusted the same way as in the Trade action. If you expand into a space neighbouring several opponent spaces with units deployed, you may use the Neighbourhood bonus for each of these units. The Neighbourhood bonus can only be used immediately after expanding. If a player expands into a space neighbouring another player's Distillery, they may buy Whisky. If the current Whisky price is £10, then they could buy three Whisky (or four in a 2 player game) from the general supply at £7 each by placing the appropriate number of their Merchants on the Whisky's up arrow. If there was also an opponent's Cheese dairy neighbouring the space they expanded into, that current player could also buy up to three Cheese at a discount (or four in a 2 player game) if they had sufficient Merchants to do so. If you deploy your fourth building of one type onto the map (Cheese dairy, Bakery or Distillery) AND your Export box is empty, you may immediately draw three Export contracts from the draw pile. Take either one or none of the Export contracts, and the unselected Export contracts are returned to the bottom of the draw pile. If you take an Export contract you pay the costs as if you performed the action Obtain an Export Contract. This bonus is still considered part of the Expand action. Pay £4 to move your Shipping marker forward one space to increase your Shipping reach. Doing so allows you to expand across rivers and lochs. Regardless of Shipping level, a player may never hop across a land space, not even along a river. No shipping: You cannot expand across any type of water. River-crossing: You can now expand directly across a river to an adjacent space. 1-loch: In addition to river-crossing, you can now expand across one loch space. 2-loch: In addition to river-crossing, you can now expand across two loch spaces etc. Players can increase the income from their Workers (Woodcutters and Miners) by upgrading their equipment. Upgraded Workers produce £2 more in the Production Phase of each round. To upgrade a Worker technology, pay £10 and flip over the corresponding Technology tile on your Player board. If you receive a Bonus Upgrade (see Direct Export Bonuses below) and you choose the Technology upgrade action you pay £5 instead of £10. Players start with two Merchants in their stock. To hire a new Merchant, pay £4 and take an additional Merchant from your Player board and add it to your stock. From now on, you may use this Merchant for future Trade actions. To fulfill an Export contract that is on your Export box, pay the Goods listed on the left half of the Export contract tile.Then you receive the benefits shown on the right half of the tile. These benefits include Import goods such as Hops, Cotton, Tobacco or Sugar cane and Direct export bonuses. When a player fulfills an Export contract with the import goods Cotton, Tobacco or Sugar cane, they move the respective token on the Export board track by as many steps as the amount imported. If the token reaches or passes a marked step (see image on the right side), the player gains £1 (if they forget to move the import token at the point of fulfilling an Export contract, they do not get the bonus afterwards!). As soon as the player has fulfilled an Export contract, they place the Export contract tile face-up next to their Export box, which is open again for a new Export contract. Export contracts never require Grain or Milk but may require any combination of the other goods. Export contracts that require Meat ( Beef or Mutton ) can only be fulfilled by slaughtering Cows or Sheep. A player slaughters their animals, as part of the Fulfil an Export Contract action, by removing the animal from the map and placing it back onto their Player board. Note that this will reduce their Milk or Wool production. It will also free the space where the animal was and any player will be able to expand there, subject to the normal expansion rules. Slaughtering is only allowed to fulfil an Export contract and does not require a separate turn. Money, taken immediately from the supply. Free space, which allows the player to immediately take an Expand action without paying the land cost of the space into which they expand. The player must still pay the unit cost, and all rules for expanding and Neighbourhood bonuses apply. Hire a Merchant from the Player board at no cost. Alternatively, the player may take one of their Merchants back from the Market instead of hiring a new one. If a player obtains multiple Bonus upgrade actions they can choose the same or different upgrades. On your turn, if you cannot or do not want to take any more Actions, you must Pass and stop taking Actions for the remainder of this round. After Passing, move your Turn order token to the leftmost available position of the next round and receive the Pass bonus money indicated. The order in which players pass determines the turn order for the next round. If a Port bonus tile is neighbouring, or within Shipping reach of, any of a player's units, that player may use the corresponding Port bonus in addition to whatever Action they perform on their turn (a Port bonus tile can be used before or after the player's main Action). A player can use the Port bonus immediately or in any future turn (as long as the player's unit is neighbouring or within shipping reach). Once you use the Port bonus, put a Port bonus marker of your colour next to the used Port bonus tile to indicate you have used it. Each player can use each Port bonus tile only once in the game (several players can use the same Port bonus tile, though). A player may use multiple Port bonus tiles in one turn. During the Production phase players receive Income and produce Goods from units that are deployed on the map. 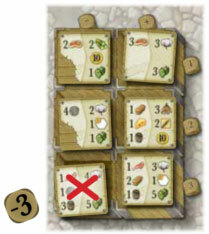 The amount of money and Goods produced in this phase is indicated by the empty slots on the Player board from which the units have been removed and that now show the Income icon. Each Woodcutter earns £4 (£6 with the Technology upgrade). Each Miner earns £6 (£8 with the Technology upgrade). Each Sheep produces one Wool. Each Cow produces one Milk. Each Field produces two Grain. Each Cheese dairy may process one Milk into one Cheese. Each Bakery may process one Grain into one Bread. Each Distillery may process one Grain into one Whisky. The Basic goods spent to produce the Processed goods can come from anywhere: including received during the current Production phase, a previous Production phase, purchased from the Market on a previous turn, etc. Hint: It is recommended that players store their current Goods and money below their Player boards and put the Goods they just produced above their Player board so players can check if they took the correct amount of Goods. Hint: Once players are familiar with how the Production phase works they can collect their Income after Passing to speed up the game. In this phase players earn the Glory bonus indicated on the bottom half of the current Scoring tile, if they have fulfilled the requirement in the top half. Glory is tracked by moving the Glory markers on the track on the Export board (take or flip a Glory marker when you complete a lap). Final Scoring takes place after five rounds are completed. Fill in the VP for each player on the Scoresheet. The player with the most VP is proclaimed the greatest Clan Chief of Caledonia and wins the game! Glory: 1 VP for each step on the Glory track. Basic goods: 1 VP for each Basic Good in your stock. Processed goods: 2 VP for each Processed good in your stock. Money: 1 VP for every £10. Leftover money breaks ties on the final score. Hops: 1 VP for each Hops imported listed on your fulfilled Export contracts. Cotton, Tobacco and Sugar cane: 3, 4 or 5 VP each according to their rarity. (The rarest Imported Good is the most valuable one!) The Import token that was moved the furthest along the track (because it was imported the most by all players) is the most common Imported Good and is worth 3 VP each, the second most Imported Good is worth 4 VP each and the least Imported Good is worth 5 VP each. If there is a tie regarding the amount of Imported Goods, Cotton is the rarest, followed by Tobacco, then Sugar cane. Players receive points for the number of Imported Goods listed on their fulfilled Export contracts multiplied by the respective VP. 3 or 4 players: 12 VP for the player with the most fulfilled Export contracts, 6 VP for the player with the second most. Game with 2 players: 8 VP for the player with the most fulfilled Export contracts only. In case of a tie, evenly divide the VP of the respective tiers among the tied players (round down if necessary). Each player counts the number of their Settlements within Shipping reach of each other. A Settlement is defined as a cluster of neighbouring units of one colour (adjacent and no river in between). Single units that are not neighbouring to any other unit of the same colour are also considered Settlements. If not all of your Settlements are within Shipping reach of each other, the biggest group of Settlements within Shipping reach of each other counts in this scoring. 3-4 players: The player with the most Settlements within Shipping reach: 18 VP; second-most: 12 VP; third-most: 6 VP. 2 players: The player with the most Settlements within Shipping reach: 12 VP; second-most: 0 VP. Tied players share the points the same way as in the Export scoring. This scoring is NOT about having expanded to the most spaces, nor is it about having built the biggest settlement! Example: If the red player has 1-loch Shipping level, red has only three Settlements within Shipping reach. If the black player has 2-loch Shipping level, the black player has five Settlements within Shipping reach. The three encircled red units are a single Settlement because they are neighboring each other. All other red units are single-unit Settlements. The two red units at the top are two Settlements because they are separated by a river. Red has four Settlements in total. However, the Settlement at the very bottom left is two loch spaces away from the three-unit Settlement and thus not within Shipping reach of any of the red Settlements. Nevertheless, this is enough to connect the Settlement with three units to the two single Settlements at the top, since 1-loch Shipping is sufficient for red to cross the one loch space in between. Therefore, only three of the red player's four Settlements are within Shipping reach and count towards the Settlement scoring. Hint: Slaughtering your animals can be beneficial or detrimental for this scoring. You can create more Settlements by slaughtering (splitting one bigger Settlement into two smaller Settlements) or harm your scoring because some Settlements might not longer be within Shipping reach. Note: If desired, starting in the fourth or fifth round of the game, you can start to track the number of settlements within shipping range per player on the Export board track using the Settlement tokens. In the 2 player game you play on a smaller map. The shaded land spaces at the edge (additionally marked by mist) are not part of the active map and so players cannot expand into them. The non-shaded spaces adjacent to the shaded spaces are the border spaces of the active map. This is relevant for Scoring tile #5 and Clan Fergusson. All loch spaces are part of the active map. In this variant you try to achieve the highest possible score. You play with the same smaller map as in the 2 player game. Use Workers of different player colours to act as neutral pieces and put them on all spaces of the active map that have a cost of £1. All these spaces will be unavailable for you for the whole game. In a solo game you cannot take a Neighbourhood bonus or track Imported goods on the Export board. Randomly draw and place five Export contracts face-up on the Export board before you start the game. Each time you pass you receive a Passing bonus of £16. At the beginning of rounds 2-5 during the Preparation phase and after Merchants were retrieved, the prices of three randomly chosen Goods are changed once each. Roll the Goods and the Price dice. The Goods die shows the price of which Good is changed. Reroll the Goods die if it shows a Good whose price was already changed in this phase. Check whether the price of this Good is below (low prices) or above (high prices) the brackets on the Market. The brackets next to the Market indicate the medium range. Prices above are high, and those below are low. When the price is low or high then you ignore the algebraic symbol (- or +). When the price is low then the price increases by the absolute value of the Price die. When the price is high then the price decreases by the absolute value of the Price die. When the price is in the medium range, then the price changes exactly according to the Price die. A '-3' will cause the price to decrease by three steps. A '+1' will increase the price by one step. Fill all empty slots on the Export board with new Export contracts from the draw pile. Your last Price die roll shows which of the six Export contracts gets removed. Find the intersection of the algebraic symbol and the numeral on the Export board and remove that Export contract from the game. Each Action phase starts with five Export contracts. These variants can be played in any combination. The following simplifications are good for your first game. If players dislike even small amounts of luck in the game, they can choose this variant. No matter how much Cotton, Tobacco or Sugar cane was imported, each is worth 4 VP each at the end of the game. Thus, there is no need to track Imported goods on the Export board. Players can simplify the game by ignoring the Scoring tiles and/or the Port tiles during setup and play. If players prefer a tighter game map, they can agree to use the backsides of four spare Port tiles to cover any four land spaces of the active map during setup in a 2-3 player game, preferably one tile per module (the map in a 4 player game is already quite tight). These spaces are not available for the Expand action. Starting player £0, second player £2, third player £4 and fourth player £6. Randomly draw as many Clan tiles as the number of players and allocate each Clan tile a random Starting tile. Randomly determine a player who bids any number of VP (or 0) to be able to choose a clan first. The player to their left can bid any higher amount of VP and so on until there is a winning bid that no player wants to outbid (30 VP is the highest possible bid). If a player does not want to bid higher, the respective player cannot bid again this auction round. The player with the winning bid writes down their bid as negative VPs on the Scoresheet, places their token on the first space of the Turn order track and takes the Clan tile along with the corresponding Starting tile. The player to their left bids for one of the remaining clans and so on until the second clan is chosen by the player with the winning bid, who then is second on the Turn order track etc. The last player without a clan is given the remaining Clan tile and Starting tile without losing any VP and is designated last in turn order.